Isaiah describes the luxurious life of the women of Jerusalem in vivid terms. The prophet was definitely not politically correct. When the Assyrians captured Lachish and other cities of Judea they took some of the people captive. Something similar must have happened when the Babylonians took captive many of the citizens of Jerusalem in 586 B.C. 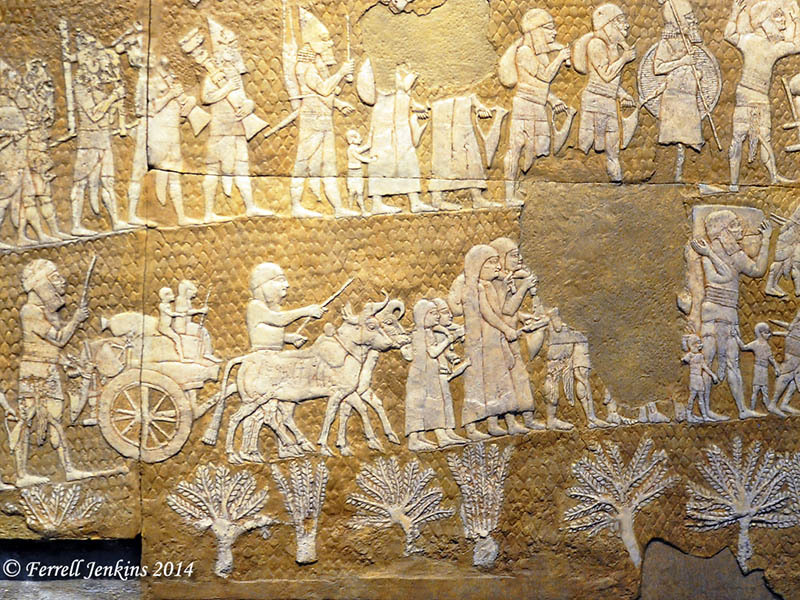 Our photo shows a portion of the relief Sennacherib left on his palace wall after the capture of Lachish. You may recognize that this is not the original now displayed in the British Museum. This replica is in the Israel Museum. Notice especially the women in the center of the bottom panel. Sennacherib’s relief showing the women of Lachish going into captivity. Replica in Israel Museum. Photo by Ferrell Jenkins. Here is the original of the same scene as it is displayed in the British Museum. Click the photo for a larger image. Sennacherib’s Relief in the British Museum. Photo by Ferrell Jenkins. The women of the Shephelah were country women and the attire they are wearing may have been normal. The stylish women of Jerusalem would become like the plain women of the country and don a skirt of sackcloth. The deportees are distinguishable by their appearance and dress. The women—adults and girls alike—wear a long, simple garment. A long shawl covers their head, shoulders and back, reaching to the bottom of the dress. The heads of both the adult men and boys are wound with scarves whose fringed ends hang down, covering the ears and reaching the level of their shoulders. A thick horizontal line below the belt probably marks the bottom of a sleeveless shirt. The garment has a fringed (?) tassel hanging between the legs, apparently attached to the bottom of the shirt. The men have short beards. Both men and women are barefooted. (The Conquest of Lachish by Sennacherib, 109). 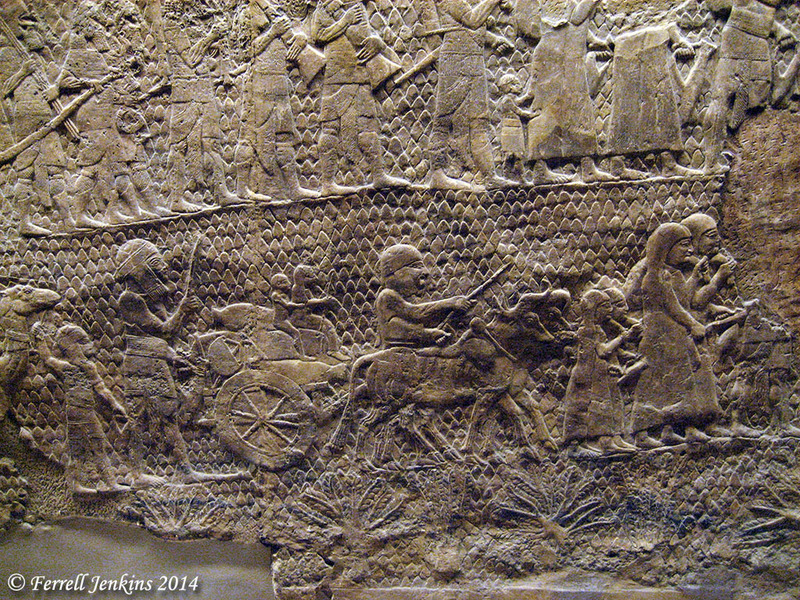 This entry was posted in Archaeology, Bible Places, Bible Study, Culture, Israel, Old Testament, Photography, Travel and tagged Assyrians, British Museum, Israel Museum. Bookmark the permalink.